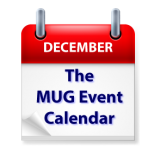 The MUG Event Calendar is really showing the effects of the holiday season this week, with lots of parties and only a few information-oriented meetings. One California group will host a remote presentation by the folks from Moneyspire to talk finance, and another will talk “all things tech” at their December meeting. Beyond that, parties dominate the listings from Pennsylvania to Connecticut, Maine to Oregon. – San Gabriel Valley Macintosh Users Group – Holiday Party! – Silicon Valley Mac User Group – Moneyspire & Potluck!